Now isn't this a cute little furry animal AND a weather predictor as well! 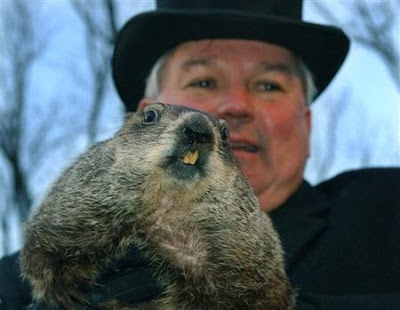 Today is February 2, Groundhog Day in the United States and Canada and Candlemas in other areas of the world. It is said that the cute, furry little groundhog emerges from his burrow today and if he fails to see his shadow because of cloudy weather, winter will be over soon. If he DOES see his shadow because it is a bright, sunshiny day, he will be frightened and run back into his hole and winter will continue for another 6 weeks, until approximately the first day of Spring. Now, what is Candlemas you might ask? Long ago, before organized Religion/Christianity, the Northern European farming cultures celebrated the seasonal Wheel Of The Year. In that calendar, today would be called Imbolc (In The Belly) or Oimelc (Milk of Ewes). At this time of year when snow enveloped the land, the seeds lay out of sight in the "womb" of Mother Earth. As the "light" grows, so do the seeds. Today is also called St. Brigit's Day in honor of the Irish Goddess Brigit, goddess or fire, patroness of Smithcraft, poetry and healing, especially midwifery. Brigit's holiday involved lighting sacred bonfires and blessing candles for the upcoming year. Here in California, we are having THE best weather, dry but wonderful every day! I've checked the Farmer's Almanac and it doesn't look like we are going to get much rain this year at all. So what am I going to do on this fabulously warm day? Make some homemade candles this afternoon, BBQ for dinner, then have a nice little bonfire in the chiminea to finish out the day. I'm also going to be thinking about those things I want to "GROW" in the new year. I'm planting the "seeds" for traits or themes I want to manifest this year; Simplicity, Unconditional Love, Gratitude, A Giving Heart. Yes, I did get to cleaning out my drawers over the weekend, the closet is next. You should see the PILE! Probably 60% of my clothes are going. When I chose what to wear this morning, it was so easy because I LOVE everything I kept! Simple!